Thanks to Dr. Ahmed F. Lazim, Al-Jumhori Teaching Hospital, Mosul (Iraq), for contributing this case. To contribute a Case of the Week, follow the guidelines on our Case of the Week page. (1) Our Feature Page for November highlights Consumable Lab Products / Clinical Lab Analyzers, and includes Leica Microsystems, Sakura Finetek USA and Ventana Medical. We also have a new Mystery Case on the right side of the Home Page. (2) We posted two new articles on our Management Page: Missing Accession Audit Process, by Diana Brooks, PSA, LLC, and Changes in the Anatomic Pathology Billing World, by Mick Raich, President, Vachette Pathology. (3) We recently updated the Fibrohistiocytic and Adipose Tissue sections of the Soft Tissue chapter, based on reviews by Vijay Shankar, M.D. 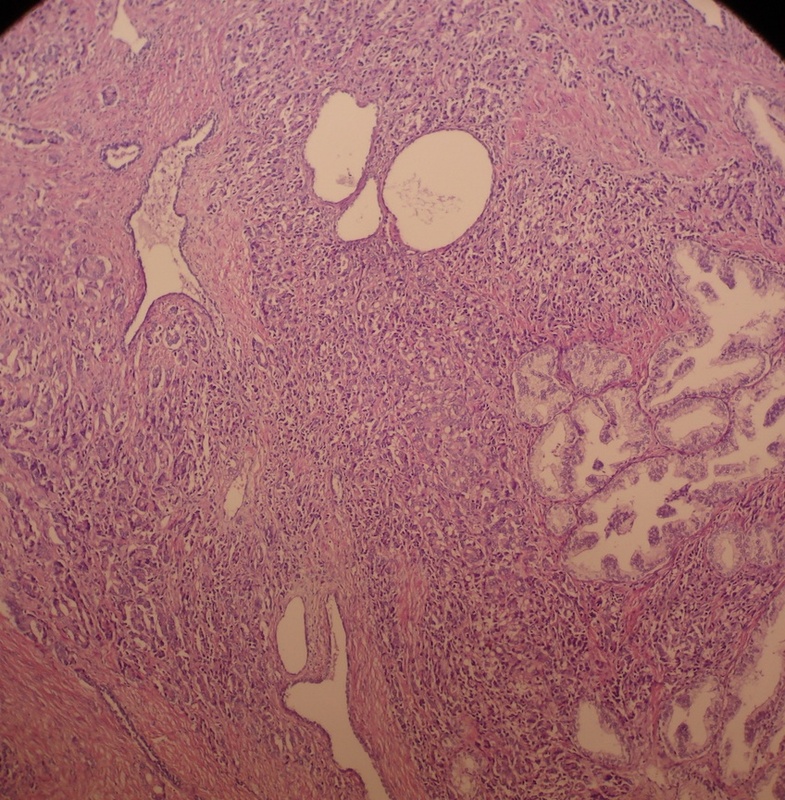 A 60 year old man underwent a prostatectomy based on an enlarged prostate. Primary signet ring adenocarcinoma of the prostate is rare (see PathologyOutlines.com topic). A Mayo Clinic review identified only 9 cases (0.03%) at their institution from 1970-2008; a PubMed review identified only 51 cases reported during 1970-2009 (Mayo Clin Proc 2010;85:1130). 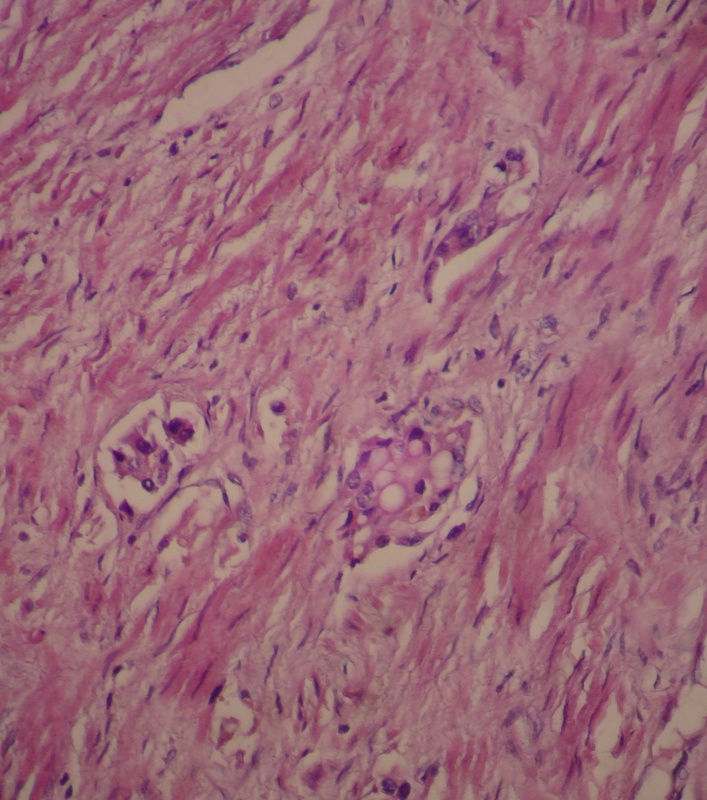 Histologically, the tumor is composed of 5-50% signet ring cells due to intracellular accumulation of mucin compressing the nucleus into a crescent shape. The cytoplasmic vacuoles often stain positively for mucin (mucicarmine-50%, PAS-60%, Alcian Blue-60%), but may also contain lipid. Tumors are typically PSA+ and PAP+, as well as keratin+ and P504S+. They are typically negative for CEA. 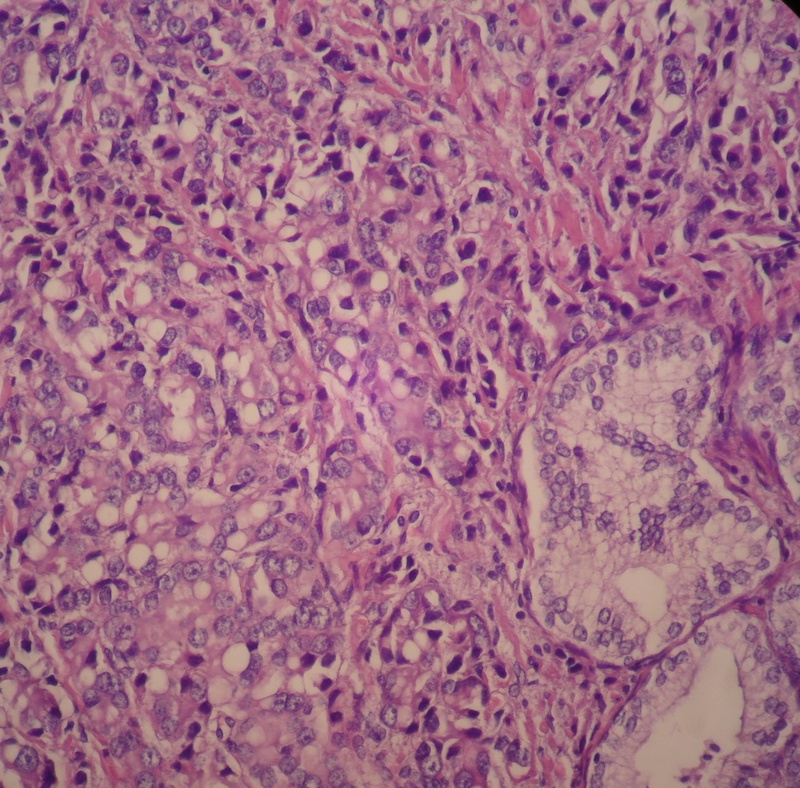 Classic prostatic adenocarcinoma is also present. The most important differential diagnosis is metastasis from a GI primary, which is much more common, and should be ruled out with a GI workup. 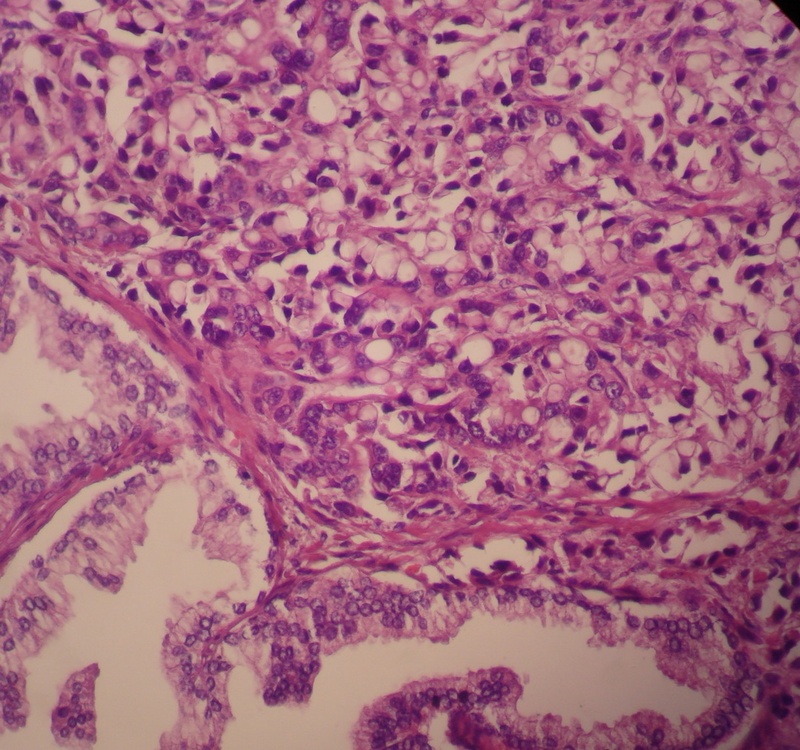 GI primaries lack classic prostatic adenocarcinoma cells, and are typically CEA+, PSA- and PAP-. In cases with limited signet ring cells, the differential also includes artifactual changes in lymphocytes post-TURP and benign signet ring change. In both cases, there is no classic adenocarcinoma, and the suspect cells are negative for PSA, PAP and mucin (Am J Surg Pathol 1986;10:795, Am J Surg Pathol 2002;26:1066). These tumors are very aggressive. Historically, up to 75% of cases presented with locally advanced or metastatic disease at diagnosis, although the figure may now be lower due to PSA testing. Treatment is similar to traditional adenocarcinoma - surgery, radiation therapy and hormonal therapy. A recent report showed a 5 year cancer-specific survival rate of 84%, with improved survival in more recent cases (Prostate Cancer 2011;2011:216169).